There are now nearly 6 million Syrian children suffering from the perils of war, including hundreds who were killed, maimed or recruited to fight in 2016, the worst year on record for Syrian children, a UN watchdog has said. At least 652 children died last year, and 255 of them were killed in or near their schools, the UNICEF report said. That signals a 20 percent increase on the number killed during 2015. UNICEF also believes more than 850 children were recruited to take part in hostilities – double the number in 2015 – and were used as executioners, suicide bombers or prison guards. While horrifying, the number pales in comparison to the 5.8 million Syrian children who are dependent on humanitarian assistance – a twelvefold increase from 2012, the organization said. “Beyond the bombs, bullets and explosions, children are dying in silence often from diseases that can otherwise be easily prevented. Access to medical care, lifesaving supplies and other basic services remains difficult,” the report added. Almost half of those in need were displaced, many of them up to seven times, and over 2.3 million children are now living as refugees in Turkey, Lebanon, Jordan, Egypt and Iraq. Child refugees living in relative safety in neighboring countries are still deprived of some basic needs, unable to go to school and forced to beg or do low-paying jobs to make the ends meet, the UNICEF report said. Unsurprisingly, many children took life-threatening journeys on the so called ‘death boats’ crossing the Mediterranean to reach Europe. Inside Syria, 2.8 million children are living in hard-to-reach areas, including 280,000 living literally on the battlefield, almost completely cut off from humanitarian aid. “I don’t know how to read or write. I only know how to draw the sky, the sea and the sun. I’ve waited tables, I served beans, corn, hummus, water pipe, potatoes, seeds. I’ve cleaned the shop and served ice cream to children,” said Fares, a six-year-old Syrian boy now living in Lebanon. With the Syrian war about to enter its sixth year, more and more people have become food-insecure. Inadequate food as a result of the protracted violence leads to poor nutrition among children and is weakening their immune system, UNICEF said, stressing that even ordinary diseases are now fatal. 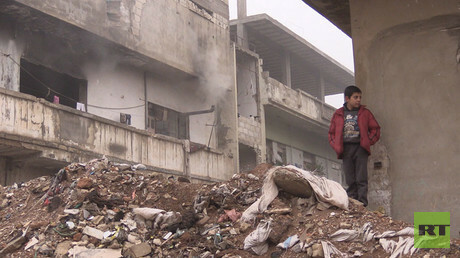 “The situation for Syrian children has hit rock bottom,” said Juliette Touma, UNICEF’s regional spokesperson.